Canyoning, abseiling and hiking in the World Heritage listed Blue Mountains National Park. Discover the incredible natural beauty of the Blue Mountains as you abseil down waterfalls and swim, jump, and slide your way along rocky canyon descents. Canyoning offers a chance to witness parts of the Blue Mountains most people never get to see. Learn to abseil at one of our designated abseiling sites or choose one of our classic, multi pitch abseiling trips overlooking the iconic Three Sisters rock formation. 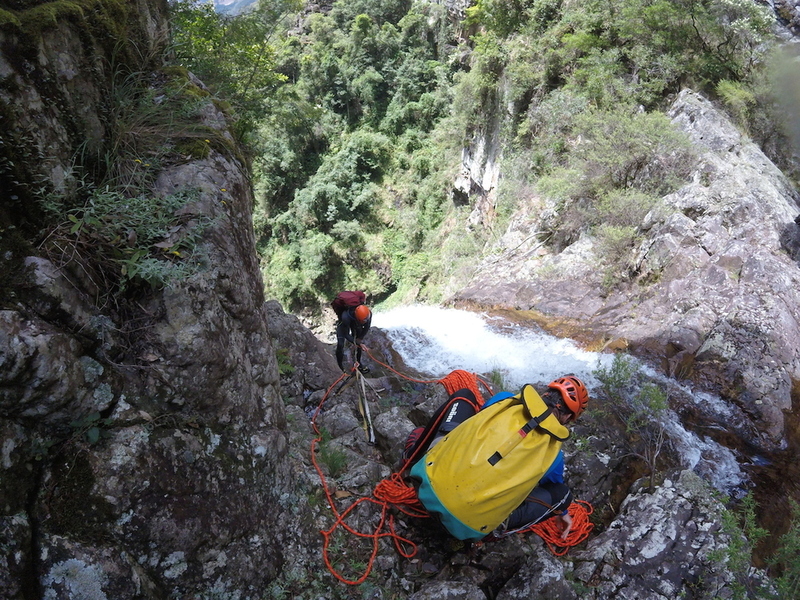 Our canyoning and abseiling trips cater for all skill levels, from beginner to advanced. Our guides are well versed in the world around them. Walking in and out of each site offers a chance to learn about the local flora and fauna, as well as the history and geography of the area. Every trip is an escape from the everyday and we encourage you to revel in the quietness and remoteness of it all. The Blue Mountains National Park, just outside Sydney, offers a true escape and an incredible taste for what the Australian wilderness has to offer. Blue Mountains Wild Adventures will get you canyoning, abseiling and hiking in the stunning World Heritage area just outside Sydney. Forget Interlaken, forget Queenstown, the Blue Mountains is like no other canyoning and abseiling destination in the world. The UNESCO World Heritage listed Blue Mountains National Park is simply unique. Talk to our team about our bushwalking trips to remote parts of the Blue Mountains, like the Six Foot Track - a three day, two night hike through rugged and pretty bushland from Katoomba to Jenolan Caves. info@bmwildadventures.com.au. We have groups leaving every day with pick ups in Sydney and Katoomba. Our trips include everything, all you need to bring is your sense of adventure.